Chili peppers are the fruits of several plants in the same family as eggplant and tomato. Most North and South American varieties are represented by the species Capsicum annuum, which includes bell peppers, jalapeños, poblanos and cayenne. The amount of “heat” in each of these peppers varies in intensity depending on specific type and how and when they are harvested. Though there is an (uneasily accepted) convention of using the spelling "chili pepper" when referring to this spice vs alternative "chile pepper"—one should note that "chili pepper" can also refer to the chili blend of spices that includes garlic and oregano. Capsicum annuum is in the Solanaceae or nightshade family . It is an upright perennial or annual shrub that grows to heights less than 1 m tall. The plant produces with small, white, pendent (hanging) flowers and elongated, yellow, orange or red fruits (berries). Its flowers help distinguish the plant from other types of domesticated peppers; rather than appearing in groups the flowers are solitary, and its filaments (thread-like stalks supporting the anther) are not purple. Capsicum annuum can be difficult to separate from the cultivated C. chinense and C. frutescens and their morphological features can overlap. These three species share the same ancestral gene pool and are sometimes called the ‘annuum-chinense-frutescens complex’. The species name annuum means “annual” from the Latin annus “year”. The common name is for the city of Cayenne in French Guiana. 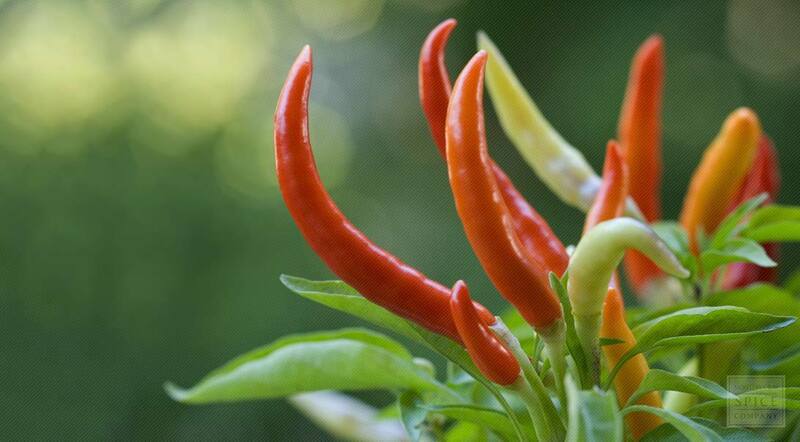 Chili pepper plants prefer full sun in a warm climate, these plants are mostly perennial in sub-tropical and tropical regions; however, they are usually grown as annuals in temperate climates. Harvest when peppers are red for hottest flavor and if you plan to crush or grind them after drying. You can harvest and use the pepper fresh, when it’s green, but the flavor may not be as hot. Drying — Use a threaded sewing needle (can use thread or fishing line) to string hot peppers through stem. Hang in full sun. Freezing — First wash thoroughly and let air dry or pat dry. Remove stem but leave the seeds in. The peppers can either be frozen in containers or plastic bags and they will taste "fresh" any time you eat them. Crushed Hot Peppers (DIY) — Make your own gourmet crushed hot peppers easily. Preheat oven 250 degrees/broil. Put dried hot peppers into oven in a pan or on a sheet of tin foil. Roast until peppers just start to darken (about 5 minutes). Let cool and put in blender. Crush to desired size. All dried forms may also be ground into a powder. Store dried peppers or powder in a cool, dry place in an airtight container. Caution should be taken when processing or handling this pepper as it can be hot and you would not want to touch your eyes, mucus membranes or similar sensitive areas after handling. Capsicum annuum is a domesticated species of the plant genus Capsicum native to southern North America and northern South America. Collectively, chili peppers are the fruits of several plants in the Capsicum genus, which are members of the nightshade family along with eggplant and tomato. Most North and South American varieties are represented by the species Capsicum annuum, which includes bell peppers, jalapeños, poblanos and cayenne. Of course, the amount of “heat” in each of these peppers varies in intensity depending on specific type and how and when they are harvested. A sensitive palate generally finds bell peppers to be well tolerated. For the culinary adventurous, however, hotter varieties may provide more “kick” than tingles on the tongue. In fact, psychologists equate the tendency to “like it hot” with thrill-seeking behavior that permits the sensation of danger without really compromising physical safety. The technical term for this is “constrained risk,” a strategy employed while watching a horror movie, skydiving, riding a roller coaster, or daring to bite into a hot pepper. Another reason to get excited over chili peppers is the fact that the phytochemical that lends them heat when ingested also thwarts pain—or a potential mugger. The primary agent in chili peppers is capsaicin, a compound that protects the plant from fungal disease, insects and herbivores. This substance is classified as a vanilloid because it contains a vanillyl functional group that dictates its behavior in chemical reactions. As such, capsaicin targets and bonds to a receptor in sensory neurons called transient vanilloid receptor subtype 1, also known as the capsaicin receptor. When stimulated, these receptors permit specialized molecules called cations to permeate cells, which modifies the electrical charge of the cell. When this event is signaled to the brain, it is interpreted as pain and burning sensations at the site. This is why capsaicin is used in pepper spray to deter a personal attack or curb a riot; when it reaches the membranes of the eyes and lungs, the effect is immediate. It also repels animals and insects. Birds, however, are unaffected by this chemical, even though capsaicin is often added to birdseed to keep squirrels from eating it. Many cooks have cayenne pepper in the kitchen to turn their food’s flavor up a notch. Cayenne pepper can be used to spice up chili, eggs, or just about anything that could use some kick. However, what most people don’t know is that cayenne pepper can also be used to treat many medical issues. For years, people have sworn by the affects of cayenne pepper on a cold or sore throat. The pepper is thought to help boost immunity and keep you going when a virus tries to get you down. That could be because it’s high in vitamin C and antioxidants that help to keep infection under control. You can make a drink using cayenne pepper, lemon juice, water, and maple syrup. This can actually help to treat a sore throat keeping it at bay. And it doesn’t taste too bad either—like spicy lemonade. Cayenne pepper also works to keep the blood circulating efficiently in the body. It can be applied to frostbite and gangrene to help draw blood to the affected areas. Some people have even been known to put cayenne pepper in the bottom of their shoes in order to keep feet warm on an icy day. If you have problems with your blood or heart, you may want to consider making cayenne pepper a part of your daily consumption. It can work as a tonic generally improving your circulation. Just make sure to talk with your doctor to make sure it won’t interfere with any medications you’ve been prescribed. If you’re taking other herbs, you may want to add a little cayenne pepper to your formula. That’s because cayenne will actually help your blood absorb other herbs more efficiently and help them to deliver their own punch. For first aid, cayenne pepper is also helpful. If you have a minor wound that’s bleeding, applying cayenne pepper directly will help to stop the bleeding quickly. It also works as a disinfectant to prevent infections from germs. You can take cayenne pepper daily, but you don’t need much. Adding about ¼ of a teaspoon to tall glass of water or juice is enough for a start. Gradually you can add more to your routine. You should also be aware that cayenne pepper comes in differing degrees of heat. Start with 30,000 HU and work your way up from there. PRINT (A BIT OF BOTANY): 1852, Flora homoeopathica, Vol 1, Hamilton, E.